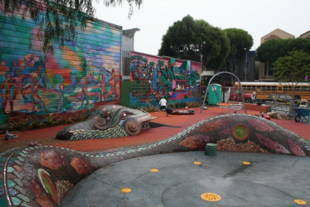 This recently-renovated mini park has great public art and murals on display! There is a children's playground with picnic tables and seating. 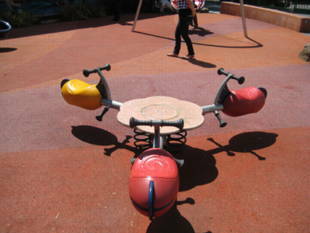 The park provides two swings and a merry-go-round for children to enjoy. 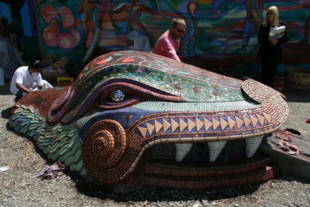 Also, kids can enjoy playing on the mosaic serpent, which shoots water from his tail! There are also many benches and picnic tables to rest, eat lunch, and watch your kids play. 24th and York Mini Park is owned by the San Francisco Recreation and Parks Department. #27 Bryant; #33 Stanyan; #9 San Bruno; #48 Quintara-24th St. Success has many fathers and the 44 mini parks now embedded in the city had four. The idea was born in March 1968 in Washington D.C. when Mayor Joseph Alioto introduced it to then-Secretary of the Interior Stewart Udall. He agreed and promised funding. 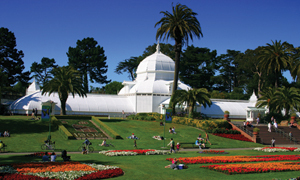 Back in San Francisco, Supervisor Robert Mendelsohn persuaded James Lang, general manager of Recreation and Parks, to take immediate action. The Mayor proposed that 20 to 25 little parks be financed on a 50-50 basis by the federal government and the City and situated on City property. The first four were to be constructed in Hunters Point, Western Addition, Bernal Heights and the Mission. And the first one to decorate the cityscape on Capp Street was the Mayor's eponymous Alioto Mini Park. The park was renovated and renamed in the 1990's. Fast forward to the early 1970s and to a 50' by 100' lot on 24th Street, vacant since a bakery that had been there burned down. The City bought it for $41,500 and constructed the 24th Street Mini Park. Shaded by trees, and a wood arbor, with children's play structures, a sand box and a lawn area, it was welcomed by neighborhood families. When it opened, Susan Cervantes, founder of Precita Eyes, the community-based mural and art center, recalls, 'I loved the park. I used to bring my children there for years.' It was wide open then, with no fences or gates, and well cared for. The subsequent installation of a narrow gate made the deep space un-inviting, except to the homeless people who moved in. Heavy use and minimal maintenance in the '80s and early ' 90s took their toll. Untrimmed trees blocking the sun, broken play structures, and poor lighting fostered vagrancy and criminal drug activity. The neighborhood, like many others, had changed, making mini parks unsavory and unsafe. In the early ' 90s, some were fenced and turned into community gardens and others closed. The 24th Street park had a happier future. 'We all decided to adopt our mini park,' said Mission resident Alfredo Pedroza, former ParkScan outreach coordinator at the Neighborhood Parks Council, and Erick Arguello, president of the Lower 24th Street Merchants and Neighborhood Association. ' We all' morphed into a purpose-driven coalition of artists and community members who met to discuss what they wanted in the park. The group included Rec and Park's project director Marvin Yee; DPW landscape architect Martha Ketterer, designers Mark Roller and Colette Crutcher, brought in by Precita Eyes Founder Susan Cervantes to create the serpent; ceramicist Aileen Barr, the SF Art Commission, and the five dozen volunteers Precita Eyes recruited to do the hand-painted tiles. Fueled by $1,050,000 from Props A & C Bond money, the Open Space Program and a State grant, the team took back the park. It opened last November. Residents, visitors, participants and Mayor Gavin Newsom walked through the widened gate, across the blue and green terrazzo, and into a new art park. On all three sides of its surrounding walls are vibrant, storytelling murals; inside the entrance a curving wall for seating and benches face the play area. Under parental eyes children play in the swing, spinning cup and teeter-totter or on the serpent. 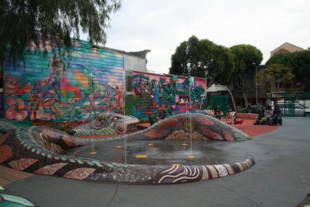 The serpent is Quetzolcoatl (ket-zawl-que-tel), the mythical feathered Azetc serpent god who appears in the murals and now undulates around the park in sculpture form. He is a celebrity of usable art--120 feet of stunning mosaic and glass tile beauty-- designed for kids to mount and walk on the gentle slopes of his body up to his head, then slide down to the rubberized floor. His tail wraps around the area with eight water spouts that shoot up into a fountain they can turn on and enjoy. In the rear of the park are picnic tables and chairs.